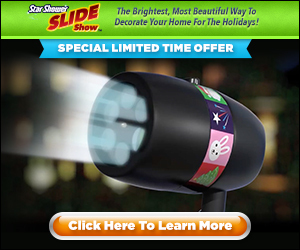 As Seen On TV Star Shower Slide Show - The Brightest, Most Beautiful Way To Decorate Your Home For The Holidays! Star Shower Slide Show keeps your home dazzling all year long! The LED projector has super bright LED lights with exciting colors. Star Shower Slide Show works on any home. Its cost efficient, water-resistant and all-weather casting! Double Offer for $39.99 + S&H.